A positive reinforcement system that 92% of teachers say motivates discouraged students and accelerates their rate of learning. Current Shadow teachers, click here to access our free online Shadow Store. 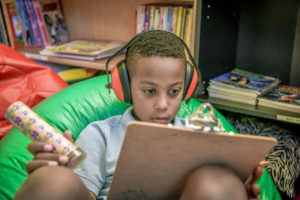 Multi-sensory, multi-cultural libraries that equip diverse learners for reading success with books tailored to their needs, and sensory tools that foster self-regulation and focus. We also provide sensory spaces that meet children’s large motor movement needs. Watch how these spaces work here. We match students–often three years behind in reading–with trained, caring mentors and assistive technology designed for those with disabilities that impact learning. With 15-minute mentoring sessions at least once a week, students quickly become independent users of reading technology, and boost their scores an average of one full grade level. Watch one student’s journey to reading success here.